Yes, we’re celebrating the Department’s 50th anniversary throughout 2016-17. Although we’ll wait until later to let you know precisely what that celebration will entail, I thought I’d let you know the rationale for why we’re celebrating this now. 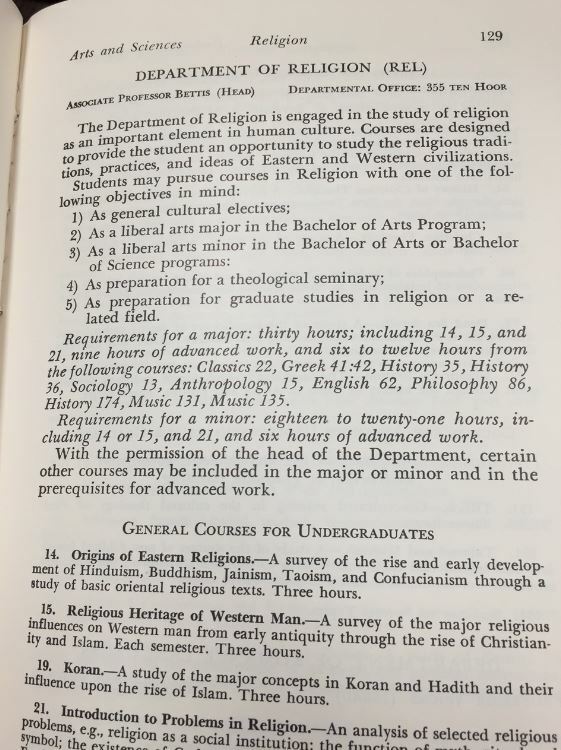 The Department of Religion (that was our name back then) was originally voluntarily staffed by campus ministers with theological training — not unlike many public universities in the US back then. 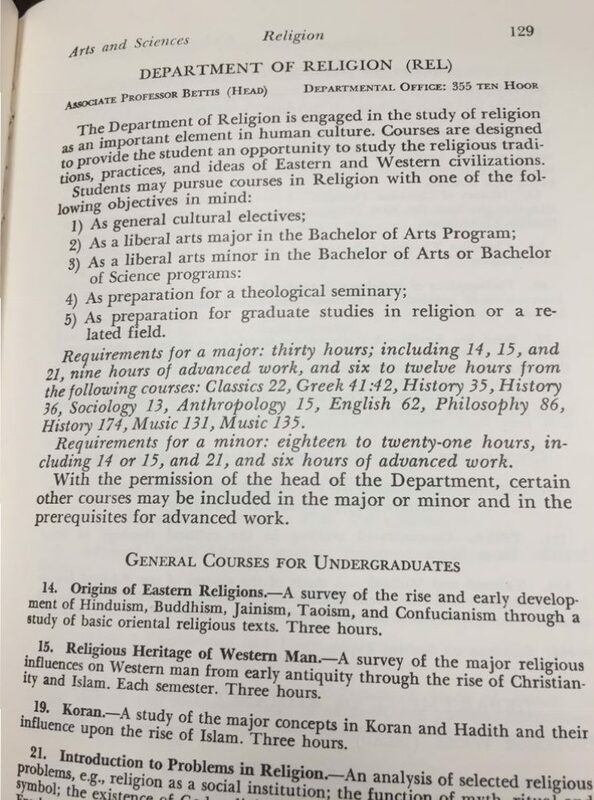 Although we’re not sure how far back that version of the Department goes (it was certainly here in the 1950s), the reinvention of the Department as offering descriptive and cross-culturally comparative courses in the study of religion dates only to the 1960s — just when Departments such as ours were being invented all across the US. For although our field dates to the late-19th century in Europe, it wasn’t until the 1960s that the study of religion in US public universities really took off. it might well be said that one’s education is not complete without a study of comparative religion or the history of religion and its relationship to the advancement of civilization. It certainly may be said that the Bible is worthy of study for its literary and historic qualities. Nothing we have said here indicates that such study of the Bible or of religion, when presented objectively as part of a secular program of education, may not be effected consistently with the First Amendment. But the exercises here [that is, in the case they are considering] do not fall into those categories. They are religious exercises, required by the States in violation of the command of the First Amendment that the Government maintain strict neutrality, neither aiding nor opposing religion. So, although declaring the school’s practices unconstitutional, the court signaled that the study of religion from a non-theological perspective might be considered essential to an education. Predictably, scholars of religion at the time jumped at this, as did a host of others (such as a variety of private funding agencies which helped to establish the field by giving schools grants to establish these new Departments) — all of whom were interested in studying religion in a way other than by training clergy or by evaluating religions on a scale of better or worse. So, on July 12, 1965, the University of Alabama, like so many other schools at this time, applied for a grant from the Danforth Foundation, for matching funds to establish a unit that was in keeping with the constitutional requirements of public education. A grant of $16,500 was given to the university to go toward operating expenses to help establish such a Department. With all this in mind, when we go to the archives we find that the 1965-6 undergraduate catalog lists Dr. Joe Bettis for the first time—along with a longstanding list of “lecturers” who mostly comprised campus ministries on campus (they all have clear theological training in the list of faculty at the back of the catalog). Leon Weinberger (who went on to become a longtime faculty member and whose office I moved into, a couple years after his retirement, when I arrived in 2001), then an advisor with Hillel, was also included for the first time in that list, but among the long list of campus ministers. The following year, 1967-8, is the first catalog to make mention of an undergrad major in REL (it is absent from prior A&S lists of majors in the college). See the pic below, taken from the 1968-9 catalog (which offers same text as the year before but here it all appears on one page, making it easy to photograph). And 1970-71’s catalog records the first time we were known as “Department of Religious Studies” — the nomenclature that was quickly becoming dominant in the US. Much of the above information was sent to the REL faculty at the end of June 2015, so that we could discuss — thinking back to a point on origins mentioned above — what would constitute our starting point for purposes of celebrating a 50th. If we went with the submission of the Danforth proposal/grant then 2015-16 was the anniversary. If we picked the first year that doctoral-holding faculty alone were appointed (i.e., the implementation of the Danforth Grant), then 2016-7 would be the 50th year. And if we picked the establishment of a major, then 2017-8 is our 50th. As should now be obvious, we opted for 2016-17 — the year the Department was represented to students in a way that has continually developed to what we are today. And although the distance between “… the study of religion as an important element of human culture” (1966-7) and today’s “studying religion in culture” may not seem so far in some ways, in yet other ways (“Eastern Religions…”) the developments have been extensive. Soon we’ll make some announcements concerning the celebrations later in the year, but for now I just thought I’d let you know that this year marks a milestone for REL here at the University of Alabama — we have a few more than two faculty now. This entry was posted in Faculty Blog, Religion in Culture and tagged 50th, Abington v Schempp, Anniversary by Russell McCutcheon. Bookmark the permalink.